If your parrot talks and plays a lot, you might want to consider purchasing him a bird toy. In that way, they wouldn’t get bored even if they’re locked inside their cage. A bird toy can also help in stimulating your bird’s mental health. It also helps to promote exercise and keeps them busy all day. Hence, choosing the right bird toy is essential. For your convenience, we have gathered the ten of the best bird toys available in the market today. Here are the following items that you should consider, presenting their features, pros, cons, and how it can help your bird to have a better quality of life. An ideal bird toy can stimulate your bird’s brain. Hence, we’ve included the Paradise Knots block chewing toy in our list. Rest assured that the multi-colored blocks can easily entice your bird. In no time at all, your bird will start playing with the toy. You can place this item inside their cage and keep it with them at all times. 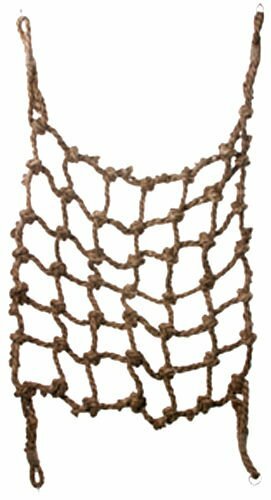 The rope is made of 100% cotton and natural sisal rope knots. Even smart birds cannot untie these ropes. It is also safe for their health. If you are looking for chewing and preening toy, this is an ideal option for you. In a reasonable price, your bird will have something that could help to improve both their physical and mental health. Thanks to its high-quality construction, rest assured that it can withstand birds who like to destroy things. Looking for a stimulating play area for your bird? Check out this large and long bid canopy from Aronico. This is designed to cater large and mid-sized birds. Made of 100% natural untreated Abaca, it will not pose a threat to your bird’s health. There are welded rings on each end for an easy attachment. You can place it inside the cage or have it indoors, and your birds can start playing. 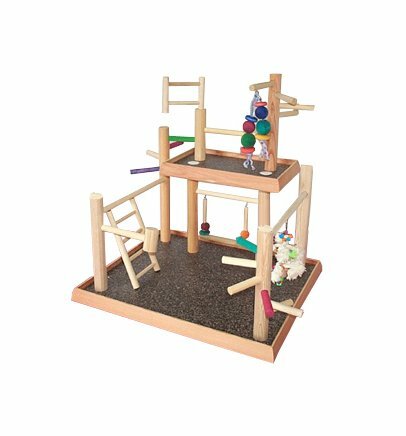 This premiere enrichment play area is a must-have for every pet owner who wants to encourage exercise and active routine for their pet birds. Thanks to its modular design, feel free to hang some toys or other accessories and entice your birds into this canopy. Because of its solid construction, you can use this canopy both indoors and outdoors. With proper care and maintenance, this product can last for a long time. When it comes to bird toys, food, and accessories, Prevue Hendryx is a well-known manufacturer. Our next product is not an exception. 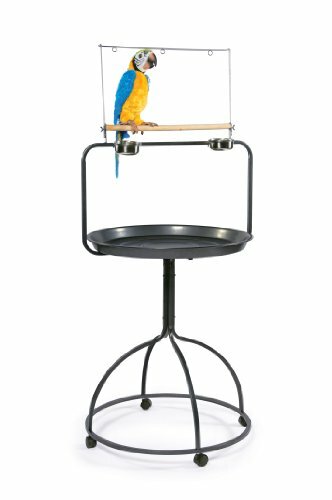 This triple-hook design parrot play stand allows you to hang treats and toys for your bird. This play stand includes two stainless steel cups. The high-edge on pan also helps on containing the mess and makes it easier for you to maintain the area clean. Thanks to its caster wheeled base, you can move the play stand without difficulty. Its size can accommodate mid-sized to large birds. You can use it indoors or outdoors because of its robust construction. The black hammertone finish of the product looks elegant in both modern living room or patio. Now your pet bird will never get bored again! Check out this Super Bird Creations bag bird toy. This will keep your Parrotlets, Parakeets, Lovebirds, and Cockatiels entertained. Since birds have an instinctual need to chew, rest assured that this bird toy can satisfy their needs for that matter. It has a quick link type cage connector, allowing you to place it inside their cage. What we like about this manufacturer is that they use a selection of bird-safe materials to ensure the health of your pets while using the product. Now your pet bird can have fun all day with this adorable straw bag stuffed with colorful crinkle shred and topped with paper fingers. There are plastic buttons, beads, and rings that your pet bird can destroy. The bag also contains some bird treats, a plus point for your bird. 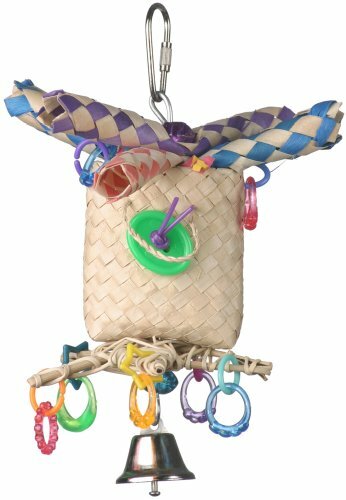 Keep your bird active by this bag bird toy. Perhaps you’re looking for a minimalistic and natural-looking bird toy? 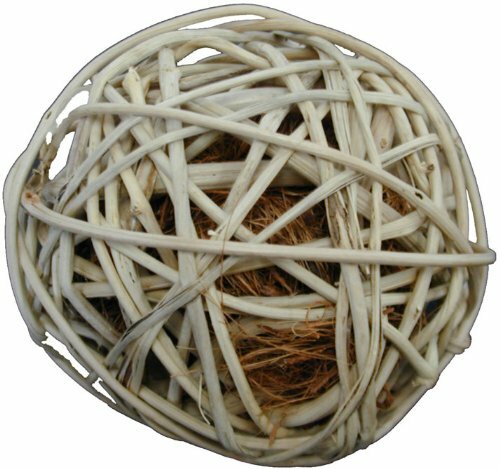 Another product from Super Birds Creation is this coco fiber ball. This item is recommended for medium to large sized birds. 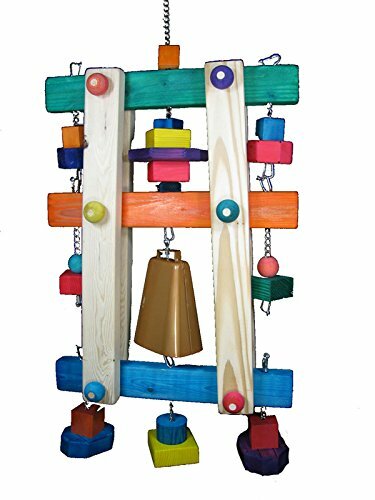 The bird toy helps in promoting excellent food dexterity and an excellent outlet, providing hours or fun inside and outside the cage. The destructible toy can satisfy your bird’s need to destroy something. Similar to other products by this manufacturer, they use 100% non-toxic and stimulating materials to ensure the well-being of your bird. Add this to the collection of your bird’s toys and rest assured that it will take long enough before your bird can finally destroy it. This coco fiber is fun to crunch and is filled with natural coconut fiber only. Encourage your pet bird to exercise with this acro bird pyramid with the base. There are four diagonal ladders with ribbed plastic rings that leads to the center pedestal of the play stand. It also includes two food and water cups. The perches can accommodate medium to large sized birds. Because of its durable construction, rest assured that this product can last for a long time with proper care and maintenance. This recreation center for pet bird will help your bird to keep busy throughout the day. The smart design consists of entertainment options and practical exercise structures. For a wide variety of parrots, this play station is suitable for them. It’s exceptionally durable and can cater even large conjures. Now you can leave your parrot playing the entire day to maintain a healthy body. Your birds will surely love this bamboo log chew toy from Paradise. The bamboo truss supports the overflowing columns of colorful wood. If you own a pet bird who loves to chew and destroy things, this is the perfect solution for you. In that way, they would leave your furniture and other things alone. Your birds can probe, play, climb, and even chew this large toy. It has a hook that allows you to mount the toy from the top of the cage. Constructed with colorful wooden blocks, cotton rope, and SS chain, rest assured that it can last for a while before your pet bird manages to destroy it. Its colorful and fun shapes can entice the bird. Keep your birds busy and active with this large bird toy from Paradise! If you love the previous play stations we’ve presented, you will also love this wooden bird gym. Keep your birds active and entertained with this activity center. It features a swing, ladders, extra eye hooks for toys, and a stable base. The base construction of this bird gym is Formica that can cater to larger birds. Because of its natural wood finishing, it will look great in any living room or patio. For pet owners who have cockatiels, Parakeets, Quakers, and Senegal, this bird gym is for them. Its improved design and modification will provide hours of entertainment and will even promote exercise to your bird. You can hang toys however you like because of its modular design. It’s simple, yet it can last for a long time. Check out this Nobby acryl coil. 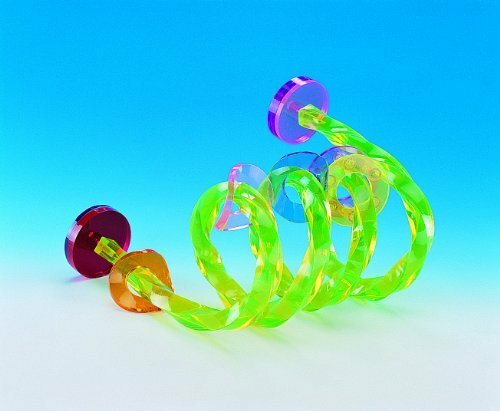 This multi-colored acryl coil will keep your birds busy. It’s an excellent choice for pet owners who are looking for a toy that can’t be easily destroyed. This bird toy is designed to satisfy your bird’s need to chew and destroy something. It can even last for weeks thanks to its screw fixation. This bird toy is suitable for small to medium-sized birds. You can fix this parrot toy to the side of the cage. Once your parrot starts playing with this toy, he will never think of escaping again or feeling trapped after all. Rest assured that even if your parrot is a shredder, this small yet durable toy will provide hours of entertainment for your feathered friend without being chopped off. You can also use it as a perch and attach some toys for more fun. Lastly, we have the Mighty Bird Toys extreme bell tower. 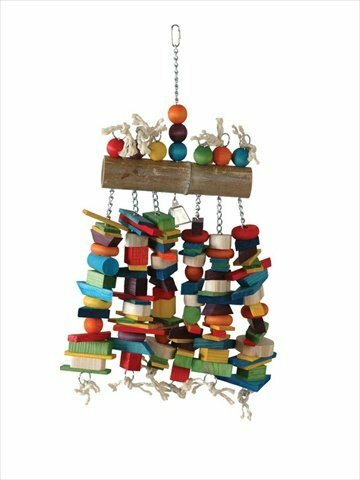 This fun and colorful bird toy are composed of big pieces of wood for the wood chewer in your feathered family. It also includes a huge indestructible bell that will surely capture their interest once they start playing with this toy. You can hang it inside the cage of your bird or just let it outside and keep them entertained for hours. The woods are solid and hard to destroy. Rest assured that it will take them a while before they can ruin the toy bird. This colorful block of woods can easily entice your bird. Once placed inside the cage, they will start playing with it. There is no assembly required for this unit. Your feathered friend can begin using it right from the box!